There is something quite chilling about an abandoned ship. Abandoned ships are often left to float in rivers or oceans for years before being wrecked or salvaged. So they act as time capsules, giving us a look into the lives of sailors from different generations. There are some ships that have been abandoned since the second world war, and even before that! The ship could have been abandoned in a hurry due to disaster, or maybe the ship wasn’t worth taking care of. Some abandoned ships are surrounded by mystery. We don’t know why they were abandoned or what happened to it’s crew. I’d avoid these creepy vessels if I were you. 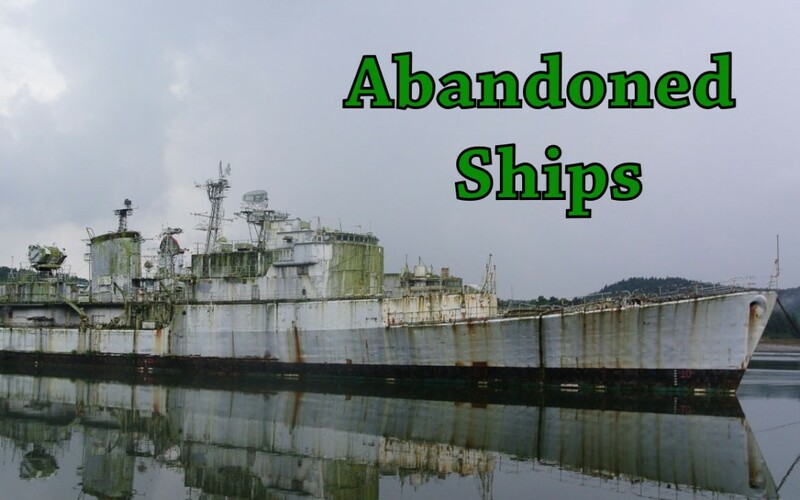 Here are 10 abandoned ship exploration videos. On the Ohio river lies a ship completely abandoned since the 1980s. It’s known by the locals as the “110 year ghost ship” as is often visited by the curious. Dozens of urban legends surround the ship and tend to focus on why it was abandoned all those years ago. It was built in 1902, and has a really interesting history. It passed through many hands as everyone wanted to own a ship like it, being steam powered. In the first world war it was used by the American government to conduct naval experiments. In the 1940 it was used by the navy to train new recruits. Forty years later it was sold to a man who neglected it. He left in on the Ohio river, where it remains to this day. The exploration in this video seems quite dangerous as the ship is so rusted and damaged. It looks like the floor could collapse under the explorers feet at any moment. It’s the USAS American Mariner, an American research ship used to to track the movement of missiles. This was in the early 1960s, when military technology was just heating up. The USAS American Mariner is the only ship to ever have served in all military branches and the US coastguard after serving as a merchant ship. Despite this impressive history, it was eventually abandoned and used for target practice. This video is really interesting because the ship isn’t explored by an actual human. It’s explored by a camera drone that’s being operated from the shore. It allows the operator to get unique views of a decaying ship that’s been abandoned for over a quarter of a century. It’s an extremely large and impressive ship, about 100 feet longer than the Titanic! It was a capable vessel, but fell out of use after airplane travel became more popular. As no one wanted to buy a ship without commercial use, it was simply abandoned. Quite a creepy part of this video is that you can hear the ghostly noise of the ship drifting on the water. In this video, an abandoned Canadian icebreaker was used in an attempt to locate a ship that sank in 1857. The 19th century ship was loaded with 21 tons of gold, which is an awful lot of gold. It was on route for New York but it sank on the journey. It was since dubbed “the ship of gold”. In the 1980s, this Canadian Ship found the 19th century vessel and rescued the gold, which was estimated to be worth over 150 million dollars. The ship that rediscovered the gold in now abandoned and you can see it in the video above. The grande hermine was a ship used by the French explorer Jacques Cartier on his voyage to North-America. In this video you will see a woman exploring a replica of this ship. The replica lies abandoned in a Canadian harbour, and has done for any years. It’s owner couldn’t afford to look after it so the ship was left uncared for. As it was seen as a risk to the public, the local police eventually destroyed much of it. But some of the ship still remains abandoned in the harbour as an unfinished relic from the past. This video show an exploration of the wrecked Costa Concordia cruise ship 2 years after the disaster. The Costa Concordia was carrying over 4 thousand people when it capsized and sank back in 2012. The captain abandoned ship and 32 people died inside it, which brought the event to international news headlines. This video show the police exploring the abandoned ship in 2014, shortly before it was re-salvaged. The event was called the Titanic of it’s age, and the video above gives us an idea why. It was a true disaster. The captain was later sentenced to 16 years in prison for causing the event and for abandoning responsibility as the captain. This video is quite mysterious. We don’t know the origin of the vessel explored or why it was abandoned. A young couple discover it drifting in solitude so they decide to investigate. They climb aboard for a brief period and find it full of old garbage. So they swim back to their own boat. Apparently it seems like some kind a commerce-related boat for some unknown state of America. It was found just off the coast of San Diego, and occupied by pelicans. The SS Dominator is a shipwreck in South Bay, California. It crashed in 1961 shortly after finding itself lost in a thick fog. It’s thought their navigation software was faulty and they therefore had no idea they were heading straight for the rocks ahead. Ever since, the ship has been completely abandoned. It remains there, slowly eroding. Slowly losing bit by bit to the waves that constantly crash into it. In the video above, you will just how far the ship wreck extends across the coastline. If anyone ever doubts the power of the sea, warn them against it. And don’t take them on boat trips with you. It was built in America during the second world war and later sold to Panama. In this video, a man explores a long abandoned ship in Indonesia. During the video he notes that the ship is completely ruined and seems quite dangerous. I would never explore an abandoned ship like this one so it’s lucky maniacs like this exist to do t for us. He goes deep into the ship,the highlight of which is when he looks into the engine room. The engine is still there. It’s was run on diesel but it’s incredibly hard to tell how old the ship is. The only obvious thing is that it’s been left uncared for a long time. Imagine exploring an entire graveyard of abandoned ships? Well that’s what happens in this video. It’s weird, because people aren’t meant to be allowed into the graveyard. But someone left the gate open one time, allowing the explorer entry. It’s weird to see so many abandoned boats in one place. To think of all their individual histories. All the different owners and journeys they have been on. All the different reasons why they were abandoned. It’s just chilling when you think about it. Still, makes a good exploration video though.